1) The sitting couple : Episode 23. 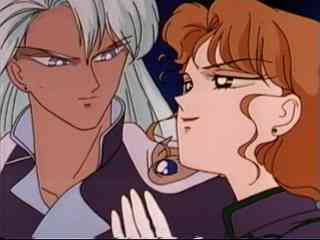 Kunzite and Zoisite are plotting in Kunzite's castle, sitting side by side, on a stone bench against the wall. And when I say side by side, their legs and sides are actually touching. 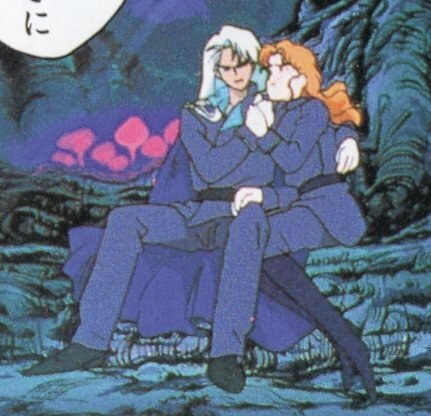 Plus, Kunzite has one arm around Zoi's shoulders, and Zoi has one hand resting on Kunzite's thigh. This is a cut from this pic below, that shows more of the Dark Kingdom background. I can't remember, for the life of me, what they're talking about. Again, Zoi is distressed over Nephrite's plans. Something about devicing a plot to get rid of Nephrite, I'm quite sure, as it ends with Zoisite calling a youma, who half steps out of shadows in their back, takes her orders and goes away. Interesting bit here is that neither Kunzite or Zoisite changed their position before they called her, which implies that pretty much everyone in the Dark Kingdom, or at least their youmas, must know of the nature of their relationship. But then, it looks pretty obvious, too, that they both live in Kunzite's castle. They don't hide much. I actually think that the only person who doesn't know about their relationship is Queen Beryl, since Kunzite notably straightens in her presence, being all professional as if to conceal his special bond with Zoisite. 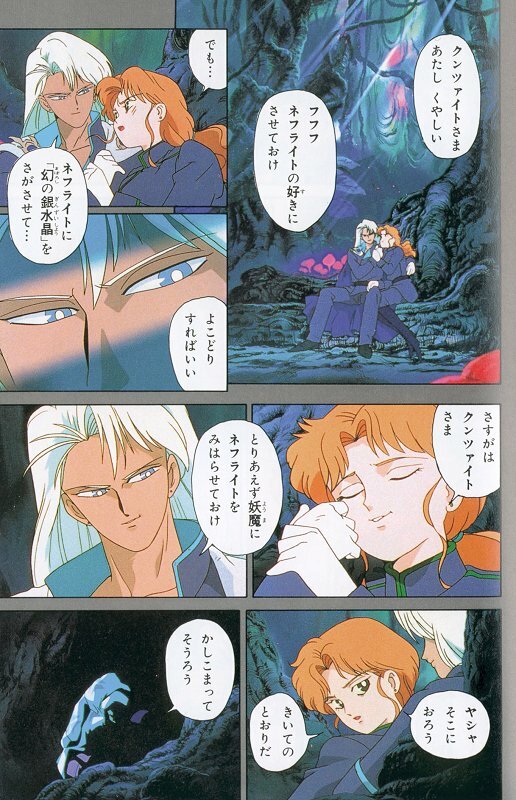 My take on that is that most youma who know of the situation assume that Kunzite, being the Ice King, and notoriously as unable to love as any shinma or youma, is just using Zoisite, and using his obvious infatuation to control him. So they just don't care. Set when Zoisite already gathered a few of the Nijizuishou and has to get back the one Sailor Moon took. They're in Kunzite's castle, and the Ice King is looking at the crystals, admiring them (now that I think of it, he *definitely* has a thing for beauty, which may explain his initial interest for Zoisite). Zoi is cutely watching at it over his shoulder (I like that bit!). They have a talk along the line of "We'll get these crystal together" blah blah, and Zoi says he'll get them for Kunzite. 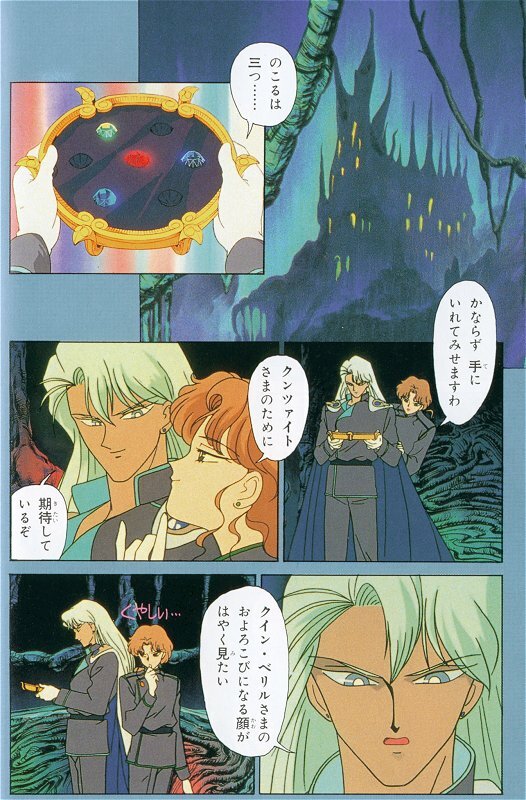 Anyway, Kunzite turns back his eyes to the Nijizuishou and says "I wish I can give them to Queen Beryl and make her happy" - at least that's how it turned out in the french dub. And that of course freezes Zoi. Who turns away, chewing his thumb with a pout and thinking "What about me? ", while a lightning cracks outside by the window. It's apparently a (badly done, actually. 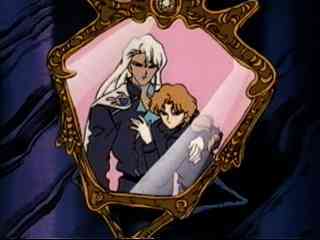 The poses are awful) portrait of him being snuggled against Kunzite, who holds a possessive arm around his shoulders. 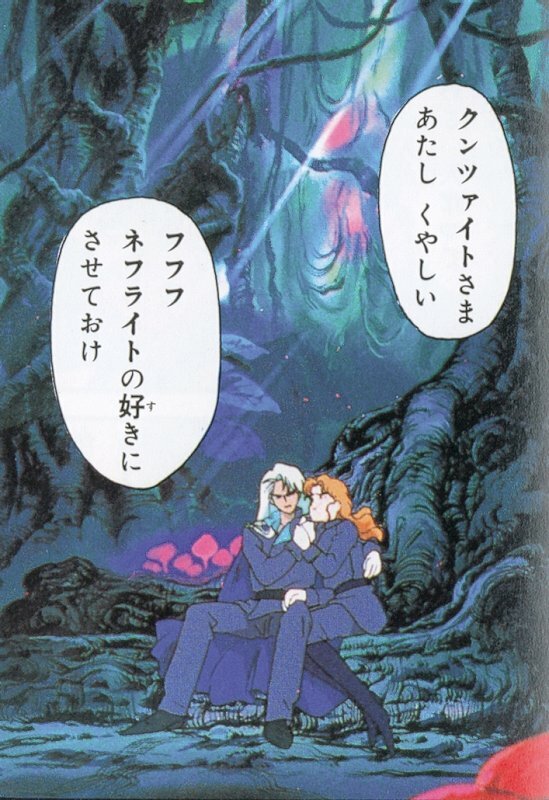 Later, after Zoi's death, the only sign that Kunzite grieves him will actually be an occasion where, before leaving for Earth for his mission (and after arguing with brainwashed Endymion), he takes the frame to give it a long look, before turning his back.